Please call 1-800-798-1504 for price quote on any specific requests including coordinating accessories such as: Coverlet, Receiving Blanket, Decorative Crib Bows, Changing Pad Cover, Diaper Stacker, Toy Bag, Crib Bib, Teddy Bear. Custom orders are not returnable or exchangeable. A 60% deposit is required on all orders. Ships in 4-6 weeks. Ballet Pink, Ivory, Oatmeal, Blue, Robin's Egg, Maize and White. For safety reasons, we recommend that you remove pillows and any crib coverlets or duvets when you put your little one down to sleep. If carrying a baby in the Moses basket, be sure to support the bottom of the basket. Never carry the basket by the handles only. 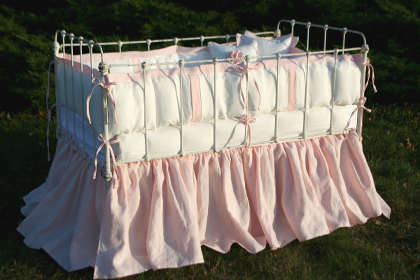 Moses baskets should only be used for babies weighing 15 lbs or less. May be returned within 30 days for a full refund. Available in Ivory with your choice of accent colors.